The winning papers are available to read for free until 15 June 2017. To celebrate our most popular articles in 2016, you can access them free of charge throughout December and January from the links below. Our most highly cited and recent articles this year have ranged from research articles such as rethinking depoliticisation: beyond the governmental which reflects on a reappraisal of depoliticisation, offering a conceptual horizon beyond a fairly narrow state-centric approach; to an in-depth analysis of behavioural change mechanisms such as nudge set against the political context of neoliberalism in the politics of behaviour change: nudge, neoliberalism and the state; to two different case studies examining different aspects of their respective policies and politics: one on the water sector offering a critical evaluation of policy translation across countries entitled rethinking the travel of ideas, and one offering a new framework that both measures and explains policy change within the context of institutional change entitled measuring and explaining policy paradigm change. 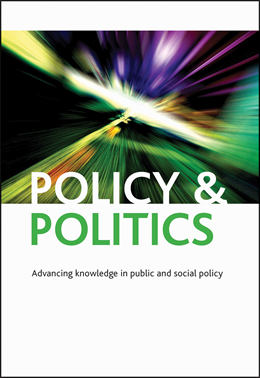 Jo Ingold and Mark Monaghan from the University of Leeds discuss their forthcoming article ‘Evidence translation: an exploration of policymakers’ use of evidence’, available via fast track from Policy & Politics.